Home / android / f7 / oppo / smartphone / specs / OPPO F7 Youth Specification. 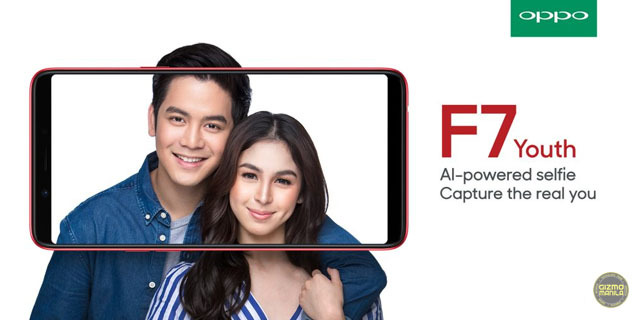 The OPPO F7 Youth features a 6-inch LTPS TFT LCD screen with all-screen display Full HD+ resolution. The phone has a glass front and back. Its back will feature a diamond cut pattern and will be available in two colours: Diamond Black and Solar Red. The OPPO F7 Youth runs in ColorOS 5.0, which is based on Android 8.1 Oreo OS. It's powered with the same MediaTek Helio P60 chipset that’s used same with the other F7 Series devices. There’s 4GB of RAM and 64GB of internal storage. You can expand the storage through a microSD card (up to 256GB). It comes packed with a 3,410mAh battery and still using a microUSB port, Not supported VOOC ultra fast charging. In terms of imaging, the phone features a 13-megapixel rear-facing camera with autofocus, LED flash, and can do 1080p video recording. It will also feature an 8-megapixel front-facing camera with a fixed-focus length. Both the cameras on the phone will have f/2.2 aperture. The F7 youth doesn't offer fingerprint reader, but you’ll have rely on the tried-and-tested PIN or password, or use the Face Unlock mechanism.